When real wars shade into the simulated environments of the war game…. “Simulated” because it was less a war and more a massacre as the large but antiquated Iraqi military was bombed to bits by the very latest weapons technology the Western coalition had at their disposal. “Simulated” because the fighting, from the perspective of the coalition military, was done at arms’ length – ground operations were little more than skirmishes, were infrequent, and not germane to the eventual outcome. And “Simulated” because the media fixated on camera-mounted missiles, guided artillery, footage of warplanes embarking and returning from their sorties, and so on. Viewers of Western news bulletins could be forgiven for thinking they were watching a piece of Hollywood militaria with state-of-the-art whizz-bang effects. The media being the media, Baudrillard was attacked by the dumb empiricists who took his provocative title literally. Yet he was right. Since 1991, Western military adventures – with perhaps the exception of Blair’s largely-forgotten Sierra Leone outing – have all followed this pattern. If anything, the strides in drone technology have increased the distance between Western combatants and the front line. 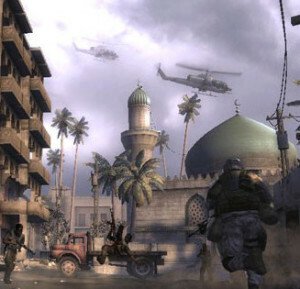 For their operators, you could be forgive for thinking war is shading into the simulated environments of the video game, with the exception that the destruction their actions wreak are very real. When politicians on both sides of the House move to vote on bombing Syria today, it is this form of warfare they have in mind. Something smart, surgical, and trained on the bad guys. Yet, if the government carry the vote, and it looks like they may, it will mark yet another step toward the virtualisation of warfare. When I was a kid, playing a game was playing for its own sake. Likewise, the extension of the RAF’s bombing of IS targets in Iraq into Syria is an exercise of war for war’s sake. As it happens, I’m not a pacifist. There are just wars, and unjust wars. IS, or whatever you want to call them, are a disgusting bunch of thugs armed with a theology that justifies and excuses their brutality. They are the very opposite of mainstream Western values, let alone the politics of labour movements and of socialism. As such, I have no principled objection against burying them under a barrage of heavy ordinance. Though motivated for their own reasons, when the US Air Force were ordered to provide the Kurdish YPG with cover in Kobane and offensive operations against IS, that was a good thing. It’d be even nicer if the US took the PKK off their terrorism list and told Turkey to stop bombing PKK positions in northern Iraq too. Here there was a clear objective and today the US still provides targeted bombing for the only unambiguously democratic and secular force in Syria. The alternative to this had the US not intervened would have been wholesale slaughter and a further strengthening of the blackest reaction. What price our non-intervention in the Syrian conflict? With Russia, France, the US, and a motley crew of Gulf states already charging about the desert skies it’s difficult to tell what difference a handful of RAF jets can make. Are there bits of IS infrastructure the others require super special British skills for? I somehow doubt it. Are there forces on the ground we can provide air cover for? The Free Syrian Army, Dave’s favoured outfit, are more interested in fighting Assad than concentrating their efforts on IS. With the Russians pounding their positions in support of the government it’s highly unlikely they’ll transfer assets and fighters to combat IS on fronts that aren’t as threatening, regardless of what the British ask of them. The al-Nusra front are unlikely to be getting any support, and for whatever reason – perhaps to avoid upsetting Erdoğan – the UK isn’t keen on the cut of the Kurds’ jib. The fighters Dave spoke of in the Commons last week were but 70,000 figments of his imagination. Without ground support, without a strategy, what then can bombing IS hope to achieve? Nothing, apart from the most extreme form of a simulated war yet. Combine everything that Baudrillard said about the Gulf War with a series of actions lacking objectives, actions that are taking place to make it look as though we are “doing something” against IS, this simulation is all about keeping up appearances – of the UK looking tough and standing with France against IS. It’s not going to work simply because it’s not setting out to achieve anything. It’s war for war’s sake, an exercise that, unfortunately, will do more harm to the civilians caught up in the bombing than damage to any terrorist infrastructure. The cynicism of it all, the very absence of any compelling case for this type of operation makes shows the proposed actions to be unjust and unwarranted. So what are UK objectives in Syria? Posted in: Africa, Conservatives, Culture, Film, International, Leisure, Middle East/North Africa, Politics, War/Defence. what I cant understand or work out is this.in world war 2 European nations including the soviet union united took on hiltler and the Nazis and there 5 million army and defeated them,now isis are the modern day Nazis simple as that,estimates say there are 100.000 isis jihadist fighters,why cant the muslim world unite and 2 raise like we did in world war 2 an army to destroy and finish off fascist isis with an iron fist,surely with 1 billion plus muslims in the world they could raise an army off lets say 1 million troops to take on these religious fascists and genocidal maniacs,we cant babysit the muslim world anymore,them days are gone,they have to get up off there own backsides and sort there sectarian wars out themselves like we did in world war 2.am I wrong.